We present the results of development of a prototype of cavity-type model of black body in the form of a graphite ampoule filled with a δMoC–C eutectic alloy of molybdenum with carbon that realizes a high-temperature reference point (HTRP) of 2856 K on the temperature scale. It is shown that the created ampoule may serve as a precision “type-A” optical radiation source. We justify the approaches to the evaluation of the uncertainty components of emissivity of the ampoule cavity equal to 0.9997 with an extended uncertainty of 0.00016 (k = 2) depending on the geometric and physical parameters with the help of numerical algorithms based on the Monte-Carlo method. Translated from Izmeritel’naya Tekhnika, No. 12, pp. 22–26, December, 2018. 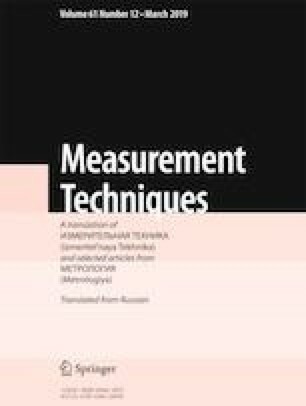 The present work was performed with the use of the equipment of the Center for Collective Use of High-Precision Measuring Technologies in the Field of Photonics established on the basis of VNIIOFI and supported by the Ministry of Education and Science of Russian Federation within the framework of the Agreement No. 14.595.21.0003 of 08.28.2017 (unique identifier RFMEFI59517X0003). G. Machin, “The kelvin redefined,” Measur. Sci. Tech., 29, Iss. 2, 022001 (2018), DOI: https://doi.org/10.1088/1361-6501/aa9ddb. Y. Yamada, H. Sakate, F. Sakuma, and A. Ono, “Radiometric observation of melting and freezing plateaus for a series of metal-carbon eutectic points in the range 1330°C to 1950°C,” Metrologia, No. 36, 207–209 (2016). DOI: https://doi.org/10.1088/0026-1394/36/3/6. V. I. Sapritsky and A. Prokhorov, “Spectral effective emissivities of nonisothermal cavities calculated by the Monte-Carlo method,” Appl. Opt., 34, Iss. 25, 5645–5652 (1995), DOI: https://doi.org/10.1364/AO.34.005645.